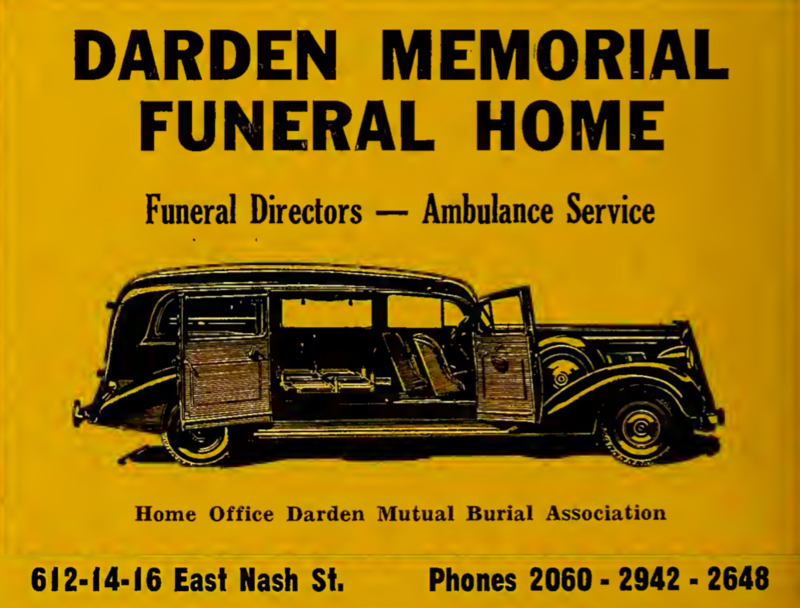 This ad for Darden Memorial Funeral Home appeared in the 1947-48 edition of Hill’s Wilson City Directory. New York Age, 3 October 1912. C.H. Dorden and Son — Charles H. Darden and son Camillus L. Darden. Dr. John W. Dorden — C.H. Darden’s son John W. Darden. Maj. McGrew — apparently, Maj. James H. McGrew was commandant of students at Saint Paul’s Normal and Industrial School in Lawrenceville, Virginia. His wife was Hattie Smith McGrew. I have been unable to discover more about McGrew’s time in Wilson. The Daily Southerner (Tarboro, N.C.), 4 June 1920. The state board of health levied five-dollar fines against undertaker Amos Batts for failing to file a death certificate and Dr. William A. Mitchner for failing to file a birth certificate. Sometime in 1914, the Wilson Times published a three-page insert highlighting the achievements of the town’s African-American community. “Wilson is fortunate in having a large proportion of sensible negroes,” the writer opined, and counted among the laudable such well-known citizens and institutions as Samuel H. Vick; J.D. Reid; Dr. Frank S. Hargrave; Charles, Camillus and Arthur Darden; Levi Jones; William Hines; Henry Tart; and H.G. Barnes; Wilson Hospital and Tubercular Home for Colored People; the Colored Graded School; First Baptist Church; Saint John A.M.E. Zion Church; C.H. Darden & Sons Undertakers; and Lincoln Benefit Society. On page one, the main text of digitized version of the insert is difficult to read, but the advertisements and photographs are clear. Surrounding an image of the just-opened Wilson Hospital and Tubercular Home are ads placed by Henry Tart, “The Transfer Man”; York Pressing Shop; and C.H. Darden Undertakers. 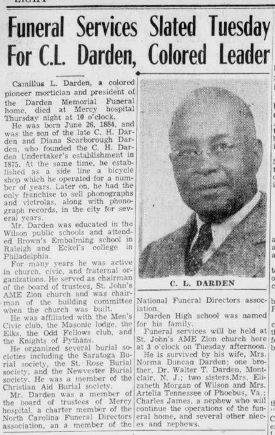 In addition to their funeral business, the Dardens touted their bicycle and firearm dealerships and their status as agents for Victor talking machines and records. The proprietors of the pressing club are listed only as Reed and Whitty. I have not been able to identify Whitty, but Reed seems to have been Lonnie Reid (a cousin of J.D. Reid), who is listed in the 1912 Hill’s city directory of Wilson operating a clothes cleaning shop at 603 East Nash Street. York was short-lived, as in the 1916 directory Reid was in business with Dunn, North Carolina, resident William Bates. Their tailor shop, Bates & Reid, also operated from 603 East Nash. Original document in the collection of the Freeman Round House Museum, Wilson, and digitized at www.digitalnc.org. Wootten & Stevens, pt. 8. In 1977, the late Hugh B. Johnston abstracted a newly discovered volume of the records of Wootten and Stevens, the earliest undertaking firm in Wilson County. The result, Funeral Register of Wootten and Stevens, Undertakers of Wilson, North Carolina, November 18, 1896-June 27, 1899 is an unpublished manuscript held at Wilson County Public Library. This post is the eighth in a series abstracting the abstract for entries naming African-Americans. A newness of manly courage. Pittsburgh Courier, 9 August 1930. Wootten & Stevens, pt. 6. In 1977, the late Hugh B. Johnston abstracted a newly discovered volume of the records of Wootten and Stevens, the earliest undertaking firm in Wilson County. The result, Funeral Register of Wootten and Stevens, Undertakers of Wilson, North Carolina, November 18, 1896-June 27, 1899 is an unpublished manuscript held at Wilson County Public Library. This post is the sixth in a series abstracting the abstract for entries naming African-Americans.